Presiden Amerika Syarikat ialah ketua negara dan ketua kerajaan Amerika Syarikat. Presiden mengetuai cawangan eksekutif kerajaan persekutuan dan merupakan ketua komander Angkatan Tentera Amerika Syarikat. Presiden dilantik untuk penggal selama empat tahun oleh rakyat melalui Badan Perwakilan Pemilih (atau oleh Dewan Perwakilan jika Badan Perwakilan Pemilih gagal untuk memberi undi majoriti mutlak kepada mana-mana calon). Sejak penubuhan jawatan ini pada tahun 1789, 43 orang telah berkhidmat sebagai presiden. Presiden pertama, George Washington, memenangi undi sebulat suara Badan Perwakilan Pemilih. Grover Cleveland berkhidmat untuk dua penggal berasingan dan dikira sebagai presiden ke–22 dan ke–24. William Henry Harrison mempunyai tempoh paling singkat sebagai presiden selepas beliau meninggal dunia 31 hari selepas menjawat jawatan ini pada tahun 1841. Franklin D. Roosevelt berkhidmat paling lama, lebih daripada dua belas tahun sebelum meninggal dunia semasa awal penggal keempat beliau pada tahun 1945. Beliau merupakan satu-satunya presiden untuk berkhidmat lebih daripada dua penggal. Sejak pengesahan Pindaan ke-22 kepada Perlembagaan Amerika Syarikat pada tahun 1951, tiada orang yang boleh dilantik menjadi presiden lebih daripada dua kali dan tiada orang yang telah berkhidmat lebih daripada dua tahun semasa penggal orang lain boleh dilantik lebih daripada sekali. Daripada individu-individu yang dilantik sebagai presiden, empat meninggal dunia semasa menjawat jawatan atas sebab-sebab semula jadi (William Henry Harrison, Zachary Taylor, Warren G. Harding, dan Franklin D. Roosevelt), empat dibunuh (Abraham Lincoln, James A. Garfield, William McKinley, dan John F. Kennedy) dan seorang meletak jawatan (Richard Nixon). ^ "The Constitution: Amendments 11–27". U.S. National Archives & Records Administration. ^ Cleaves, Freeman (1939). Old Tippecanoe: William Henry Harrison and His Time. C. Scribner's Sons. m/s. 152. ^ Ingersoll, Jared. "Death of the President". University of Virginia's Miller Center of Public Affairs. ^ Russell, Francis (1962). The Shadow of Blooming Grove – Warren G. Harding in His Times. Easton Press. m/s. 591. ISBN 0070543380. ^ "Big Ben Parker and President McKinley's Assassination". Math.buffalo.edu. ^ "Nixon Resigns". The Washington Post. ^ The White House. "Biography of George Washington". Whitehouse.gov. ^ "George Washington – no Political Party – 1st President – American Presidents". History. ^ "Life Portrait of George Washington". American Presidents: Life Portraits. C-SPAN. ^ "George Washington's views on political parties in America | Washington Times Communities". Communities.washingtontimes.com. ^ "Biography of John Adams". Whitehouse.gov. ^ "John Adams – Federalist Party – 2nd President – American Presidents". History. ^ "Life Portrait of John Adams". American Presidents: Life Portrait. C-SPAN. ^ "Biography of Thomas Jefferson". Whitehouse.gov. ^ "Thomas Jefferson – Democratic-Republican Party – 3rd President – American Presidents". History. ^ "Life Portrait of Thomas Jefferson". American Presidents: Life Portrait. C-SPAN. ^ "Biography of James Madison". Whitehouse.gov. ^ "James Madison – Democratic-Republican Party – 4th President – American Presidents". History. ^ "Life Portrait of James Madison". American Presidents: Life Portrait. C-SPAN. ^ "James Monroe – Democratic-Republican Party – 5th President – American Presidents". History. ^ "Life Portrait of James Monroe". American Presidents: Life Portrait. C-SPAN. ^ "Biography of John Quincy Adams". Whitehouse.gov. ^ "John Quincy Adams – Federalist, Democratic-Republican, National Republican, WHIG Party – 6th President – American Presidents". History. ^ "Life Portrait of John Quincy Adams". American Presidents: Life Portrait. C-SPAN. ^ "Biography of Andrew Jackson". Whitehouse.gov. ^ "Andrew Jackson – Democratic-Republican Party – 7th President – American Presidents". History. ^ "Life Portrait of Andrew Jackson". American Presidents: Life Portrait. C-SPAN. ^ "Biography of Martin Van Buren". Whitehouse.gov. 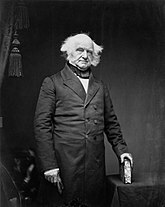 ^ "Martin Van Buren – Democratic-Republican, Democratic, and Free Soil Party – 8th President – American Presidents". History. ^ "Life Portrait of Martin Van Buren". American Presidents: Life Portrait. C-SPAN. ^ "Biography of William Henry Harrison". Whitehouse.gov. ^ "William Henry Harrison – WHIG Party – 9th President – American Presidents". History. ^ "Life Portrait of William Henry Harrison". American Presidents: Life Portrait. C-SPAN. ^ "Biography of John Tyler". Whitehouse.gov. ^ "John Tyler – No Party – 10th President – American Presidents". History. ^ "Life Portrait of John Tyler". American Presidents: Life Portrait. C-SPAN. ^ "Biography of James Polk". Whitehouse.gov. ^ "James Polk – Democratic Party – 11th President – American Presidents". History. ^ "Life Portrait of James K. Polk". American Presidents: Life Portrait. C-SPAN. ^ "Biography of Zachary Taylor". Whitehouse.gov. ^ "Zachary Taylor – WHIG Party – 12th President – American Presidents". History. ^ "Life Portrait of Zachary Taylor". American Presidents: Life Portrait. C-SPAN. ^ "Biography of Millard Fillmore". Whitehouse.gov. ^ "Millard Fillmore – WHIG Party – 13th President – American Presidents". History. ^ "Life Portrait of Millard Fillmore". American Presidents: Life Portrait. C-SPAN. ^ "Biography of Franklin Pierce". Whitehouse.gov. ^ "Franklin Pierce – Democratic Party – 14th President – American Presidents". History. ^ "Life Portrait of Franklin Pierce". American Presidents: Life Portrait. C-SPAN. ^ "Biography of James Buchanan". Whitehouse.gov. ^ "James Buchanan – Democratic Party – 15th President – American Presidents". History. ^ "Life Portrait of James Buchanan". American Presidents: Life Portrait. C-SPAN. ^ "Biography of Abraham Lincoln". Whitehouse.gov. ^ "Abraham Lincoln – Republic, National Union Party – 16th President – American Presidents". History. ^ "Life Portrait of Abraham Lincoln". American Presidents: Life Portrait. C-SPAN. ^ "Biography of Andrew Johnson". Whitehouse.gov. ^ "Andrew Johnson – National Union Party – 17th President – American Presidents". History. ^ "Life Portrait of Andrew Johnson". American Presidents: Life Portrait. C-SPAN. ^ "Biography of Ulysses S. Grant". Whitehouse.gov. ^ "Ulysses S. Grant – National Union Party – 18th President – American Presidents". History. ^ "Life Portrait of Ulysses S. Grant". American Presidents: Life Portrait. C-SPAN. ^ "Biography of Rutherford B. Hayes". Whitehouse.gov. ^ "Rutherford B. Hayes – Republican Party – 19th President – American Presidents". History. ^ "Life Portrait of Rutherford B. Hayes". American Presidents: Life Portrait. C-SPAN. ^ "Biography of James Garfield". Whitehouse.gov. ^ "James Garfield – Republican Party – 20th President – American Presidents". History. ^ "Life Portrait of James Garfield". American Presidents: Life Portrait. C-SPAN. ^ "Biography of Chester Arthur". Whitehouse.gov. ^ "Chester A. Arthur – Republican Party – 21st President – American Presidents". History. ^ "Life Portrait of Chester A. Arthur". American Presidents: Life Portrait. C-SPAN. ^ a b "Grover Cleveland – Democratic Party – 22nd and 24th President – American Presidents". History. ^ a b "Life Portrait of Grover Cleveland". American Presidents: Life Portrait. C-SPAN. ^ "Biography of Benjamin Harrison". Whitehouse.gov. ^ "William Henry Harrison – Whig Party – 23rd President – American Presidents". History. ^ "Life Portrait of Benjamin Harrison". American Presidents: Life Portrait. C-SPAN. ^ "Biography of William McKinley". Whitehouse.gov. ^ "William McKinley – Republican Party – 25th President – American Presidents". History. ^ "Life Portrait of William McKinley". American Presidents: Life Portrait. C-SPAN. ^ "Biography of Theodore Roosevelt". Whitehouse.gov. ^ "Theodore Roosevelt – Republican, Bull Moose Party – 26th President – American Presidents". History. ^ "Life Portrait of Theodore Roosevelt". American Presidents: Life Portrait. C-SPAN. ^ "Biography of William Howard Taft". Whitehouse.gov. ^ "William Howard Taft – Republican Party – 27th President – American Presidents". History. ^ "Life Portrait of William Howard Taft". American Presidents: Life Portrait. C-SPAN. ^ "Biography of Woodrow Wilson". Whitehouse.gov. ^ "Woodrow Wilson – Democratic Party – 28th President – American Presidents". History. ^ "Life Portrait of Woodrow Wilson". American Presidents: Life Portrait. C-SPAN. ^ "Biography of Warren G. Harding". Whitehouse.gov. ^ "Warren Harding – Republican Party – 29th President – American Presidents". History. ^ "Life Portrait of Warren G. Harding". American Presidents: Life Portrait. C-SPAN. ^ "Biography of Calvin Coolidge". Whitehouse.gov. ^ "Calvin Coolidge – Republican Party – 30th President – American Presidents". History. ^ "Life Portrait of Calvin Coolidge". American Presidents: Life Portrait. C-SPAN. ^ "Biography of Herbert Hoover". Whitehouse.gov. ^ "Herbert Hoover – Republican Party – 31st President – American Presidents". History. ^ "Life Portrait of Herbert Hoover". American Presidents: Life Portrait. C-SPAN. ^ "Biography of Franklin D. Roosevelt". Whitehouse.gov. ^ "Franklin D. Roosevelt – Democratic Party – 32nd President – American Presidents". History. ^ "Life Portrait of Franklin D. Roosevelt". American Presidents: Life Portrait. C-SPAN. ^ "Biography of Harry S Truman". Whitehouse.gov. ^ "Harry S Truman – Democratic Party – 33rd President – American Presidents". History. ^ "Life Portrait of Harry S. Truman". American Presidents: Life Portrait. C-SPAN. ^ "Biography of Dwight D. Eisenhower". Whitehouse.gov. ^ "Dwight D. Eisenhower – Democratic Party – 34th President – American Presidents". History. ^ "Life Portrait of Dwight D. Eisenhower". American Presidents: Life Portrait. C-SPAN. ^ "Biography of John F. Kennedy". Whitehouse.gov. ^ "John F. Kennedy – Democratic Party – 35th President – American Presidents". History. ^ "Life Portrait of John F. Kennedy". American Presidents: Life Portrait. C-SPAN. ^ "Lyndon B. Johnson – Democratic Party – 36th President – American Presidents". History. ^ "Life Portrait of Lyndon B. Johnson". American Presidents: Life Portrait. C-SPAN. ^ "Richard M. Nixon". Whitehouse.gov. ^ "Richard Nixon – Republican Party – 37th President – American Presidents". History. ^ "Life Portrait of Richard M. Nixon". American Presidents: Life Portrait. C-SPAN. ^ "Biography of Gerald R. Ford". Whitehouse.gov. ^ "Gerald Ford – Republican Party – 38th President – American Presidents". History. ^ "Life Portrait of Gerald R. Ford". American Presidents: Life Portrait. C-SPAN. ^ "Biography of Jimmy Carter". Whitehouse.gov. ^ "Jimmy Carter – Democratic Party – 39th President – American Presidents". History. ^ "Life Portrait of Jimmy Carter". American Presidents: Life Portrait. C-SPAN. ^ "Biography of Ronald Reagan". Whitehouse.gov. 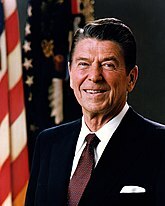 ^ "Ronald Reagan – Republican Party – 40th President – American Presidents". History. ^ "Life Portrait of Ronald Reagan". American Presidents: Life Portrait. C-SPAN. ^ "Biography of George Herbert Walker Bush". Whitehouse.gov. ^ "George H. W. Bush – Republican Party – 41st President – American Presidents". History. ^ "Life Portrait of George H.W. Bush". American Presidents: Life Portrait. C-SPAN. ^ "Biography of William J. Clinton". Whitehouse.gov. ^ "Bill Clinton – Democratic Party – 42nd President – American Presidents". History. ^ "Life Portrait of Bill Clinton". American Presidents: Life Portrait. C-SPAN. ^ "Biography of President George W. Bush". Whitehouse.gov. ^ "George W. Bush – Republican Party – 43rd President – American Presidents". History. ^ "Barack Obama – Democratic Party – 44th President – American Presidents". History. ^ Jamaica Hospital. 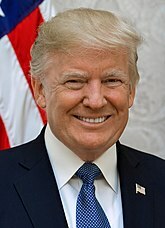 "Certificate of Birth: Donald John Trump" (PDF). Fox News Channel. Diarkibkan (PDF) daripada yang asal pada April 9, 2011.